Phytochromes are a class of photoreceptor in plants, bacteria and fungi use to detect light. They are sensitive to light in the red and far-red region of the visible spectrum and can be classed as either Type I, which are activated by far-red light, or Type II that are activated by red light. Recent advances have suggested that phytochromes also act as temperature sensors, as warmer temperatures enhance their de-activation. Phytochromes control many aspects of plant development. They regulate the germination of seeds (photoblasty), the synthesis of chlorophyll, the elongation of seedlings, the size, shape and number and movement of leaves and the timing of flowering in adult plants. Phytochromes are widely expressed across many tissues and developmental stages. Other plant photoreceptors include cryptochromes and phototropins, which respond to blue and ultraviolet-A light and UVR8, which is sensitive to ultraviolet-B light. Phytochromes consist of a protein, covalently linked to a bilin chromophore. 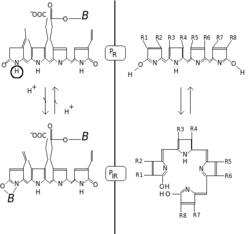 The protein part comprises two identical chains (A and B). Each chain has a PAS domain, GAF domain and PHY domain. Domain arrangements in plant, bacterial and fungal phytochromes are comparable insofar, as the three N-terminal domains are always PAS, GAF and PHY domains. However C-terminal domains are more divergent. The PAS domain serves as a signal sensor and the GAF domain is responsible for binding to cGMP and also senses light signals. Together, these subunits form the phytochrome region, which regulates physiological changes in plants to changes in red and far red light conditions. In plants, red light changes phytochrome to its biologically active form, while far red light changes the protein to its biologically inactive form. Two hypotheses, explaining the light - induced phytochrome conversions (PR - red form, PIR - far red form, B - protein). Left - H+ dissociation. Right - formation of the chlorophyll - like ring. Phytochromes are characterised by a red/far-red photochromicity. Photochromic pigments change their "colour" (spectral absorbance properties) upon light absorption. In the case of phytochrome the ground state is Pr, the r indicating that it absorbs red light particularly strongly. The absorbance maximum is a sharp peak 650–670 nm, so concentrated phytochrome solutions look turquoise-blue to the human eye. 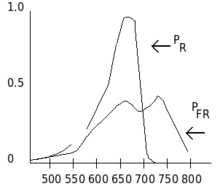 But once a red photon has been absorbed, the pigment undergoes a rapid conformational change to form the Pfr state. Here fr indicates that now not red but far-red (also called "near infra-red"; 705–740 nm) is preferentially absorbed. This shift in absorbance is apparent to the human eye as a slightly more greenish colour. When Pfr absorbs far-red light it is converted back to Pr. Hence, red light makes Pfr, far-red light makes Pr. In plants at least Pfr is the physiologically active or "signalling" state. Chemically, phytochrome consists of a chromophore, a single bilin molecule consisting of an open chain of four pyrrole rings, covalently bonded to the protein moiety via highly conserved cysteine amino acid. It is the chromophore that absorbs light, and as a result changes the conformation of bilin and subsequently that of the attached protein, changing it from one state or isoform to the other. The phytochrome chromophore is usually phytochromobilin, and is closely related to phycocyanobilin (the chromophore of the phycobiliproteins used by cyanobacteria and red algae to capture light for photosynthesis) and to the bile pigment bilirubin (whose structure is also affected by light exposure, a fact exploited in the phototherapy of jaundiced newborns). The term "bili" in all these names refers to bile. Bilins are derived from the closed tetrapyrrole ring of haem by an oxidative reaction catalysed by haem oxygenase to yield their characteristic open chain. Chlorophyll too is derived from haem (Heme). In contrast to bilins, haem and chlorophyll carry a metal atom in the center of the ring, iron or magnesium, respectively. The Pfr state passes on a signal to other biological systems in the cell, such as the mechanisms responsible for gene expression. Although this mechanism is almost certainly a biochemical process, it is still the subject of much debate. It is known that although phytochromes are synthesized in the cytosol and the Pr form is localized there, the Pfr form, when generated by light illumination, is translocated to the cell nucleus. This implies a role of phytochrome in controlling gene expression, and many genes are known to be regulated by phytochrome, but the exact mechanism has still to be fully discovered. It has been proposed that phytochrome, in the Pfr form, may act as a kinase, and it has been demonstrated that phytochrome in the Pfr form can interact directly with transcription factors. The phytochrome pigment was discovered by Sterling Hendricks and Harry Borthwick at the USDA-ARS Beltsville Agricultural Research Center in Maryland during a period from the late 1940s to the early 1960s. Using a spectrograph built from borrowed and war-surplus parts, they discovered that red light was very effective for promoting germination or triggering flowering responses. The red light responses were reversible by far-red light, indicating the presence of a photoreversible pigment. The phytochrome pigment was identified using a spectrophotometer in 1959 by biophysicist Warren Butler and biochemist Harold Siegelman. Butler was also responsible for the name, phytochrome. In 1983 the laboratories of Peter Quail and Clark Lagarias reported the chemical purification of the intact phytochrome molecule, and in 1985 the first phytochrome gene sequence was published by Howard Hershey and Peter Quail. By 1989, molecular genetics and work with monoclonal antibodies that more than one type of phytochrome existed; for example, the pea plant was shown to have at least two phytochrome types (then called type I (found predominantly in dark-grown seedlings) and type II (predominant in green plants)). It is now known by genome sequencing that Arabidopsis has five phytochrome genes (PHYA - E) but that rice has only three (PHYA - C). While this probably represents the condition in several di- and monocotyledonous plants, many plants are polyploid. Hence maize, for example, has six phytochromes - phyA1, phyA2, phyB1, phyB2, phyC1 and phyC2. While all these phytochromes have significantly different protein components, they all use phytochromobilin as their light-absorbing chromophore. Phytochrome A or phyA is rapidly degraded in the Pfr form - much more so than the other members of the family. In the late 1980s, the Vierstra lab showed that phyA is degraded by the ubiquitin system, the first natural target of the system to be identified in eukaryotes. In 1996 a gene in the newly sequenced genome of the cyanobacterium Synechocystis was noticed to have a weak similarity to those of plant phytochromes, the first evidence of phytochromes outside the plant kingdom. Jon Hughes in Berlin and Clark Lagarias at UC Davis subsequently showed that this gene indeed encoded a bona fide phytochrome (named Cph1) in the sense that it is a red/far-red reversible chromoprotein. Presumably plant phytochromes are derived from an ancestral cyanobacterial phytochrome, perhaps by gene migration from the chloroplast to the nucleus. Subsequently, phytochromes have been found in other prokaryotes including Deinococcus radiodurans and Agrobacterium tumefaciens. In Deinococcus phytochrome regulates the production of light-protective pigments, however in Synechocystis and Agrobacterium the biological function of these pigments is still unknown. In 2005, the Vierstra and Forest labs at the University of Wisconsin published a three-dimensional structure of a truncated Deinococcus phytochrome (PAS/GAF domains). This paper revealed that the protein chain forms a knot - a highly unusual structure for a protein. In 2008, two groups around Essen and Hughes in Germany and Yang and Moffat in the US published the three-dimensional structures of the entire photosensory domain. One structures was for the Synechocystis sp. (strain PCC 6803) phytochrome in Pr and the other one for the Pseudomonas aeruginosa phytochrome in the Pfr state. The structures showed that a conserved part of the PHY domain, the so-called PHY tongue, adopts different folds. In 2014 it was confirmed by Takala et al that the refolding occurs even for the same phytochrome (from Deinococcus) as a function of illumination conditions. Around 1989, several laboratories were successful in producing transgenic plants which produced elevated amounts of different phytochromes (overexpression). In all cases the resulting plants had conspicuously short stems and dark green leaves. Harry Smith and co-workers at Leicester University in England showed that by increasing the expression level of phytochrome A (which responds to far-red light), shade avoidance responses can be altered. As a result, plants can expend less energy on growing as tall as possible and have more resources for growing seeds and expanding their root systems. This could have many practical benefits: for example, grass blades that would grow more slowly than regular grass would not require mowing as frequently, or crop plants might transfer more energy to the grain instead of growing taller. ^ PDB: 3G6O​; Yang X, Kuk J, Moffat K (2009). "Crystal structure of P. aeruginosa bacteriaphytochrome PaBphP photosensory core domain mutant Q188L". Proc. Natl. Acad. Sci. U.S.A. 106: 15639–15644. doi:10.1073/pnas.0902178106. PMC 2747172  . PMID 19720999. ^ Li J, Li G, Wang H, Wang Deng X. "Phytochrome signaling mechanisms". Arabidopsis Book. 9: e0148. doi:10.1199/tab.0148. PMC 3268501  . PMID 22303272. ^ Britz SJ, Galston AW (Feb 1983). "Physiology of Movements in the Stems of Seedling Pisum sativum L. cv Alaska : III. Phototropism in Relation to Gravitropism, Nutation, and Growth". Plant Physiol. 71 (2): 313–318. doi:10.1104/pp.71.2.313. PMC 1066031  . ^ Walker TS, Bailey JL (Apr 1968). "Two spectrally different forms of the phytochrome chromophore extracted from etiolated oat seedlings". Biochem J. 107 (4): 603–605. doi:10.1042/bj1070603. PMC 1198706  . ^ Mauseth, James D. (2003). Botany : An Introduction to Plant Biology (3rd ed.). Sudbury, MA: Jones and Bartlett Learning. pp. 422–427. ISBN 0-7637-2134-4. ^ Robson, P. R. H., McCormac, A. C., Irvine, A. S. & Smith, H. Genetic engineering of harvest index in tobacco through overexpression of a phytochrome gene. Nature Biotechnol. 14, 995–998 (1996). 6. ^Gururani, Mayank Anand, Markkandan Ganesan, and Pill-Soon Song. "Photo-biotechnology as a tool to improve agronomic traits in crops." Biotechnology Advances (2014). Lia H, Zhangb J, Vierstra RD, Lia H (2010). "Quaternary organization of a phytochrome dimer as revealed by cryoelectron microscopy". PNAS. 107: 10872–10877. doi:10.1073/pnas.1001908107. PMC 2890762  . PMID 20534495. Terry and Gerry Audesirk. Biology: Life on Earth. Phytochromes are red/far-red photochromic biliprotein photoreceptors which regulate plant development. They are widely represented in both photosynthetic and non-photosynthetic bacteria and are known in a variety of fungi. Although sequence similarities are low, this domain is structurally related to PF01590  which is generally located immediately N-terminal to this domain. Compared with PF01590 this domain carries an additional tongue-like hairpin loop between the fifth beta-sheet and the sixth alpha-helix which functions to seal the chromophore pocket and stabilise the photoactivated far-red-absorbing state (Pfr) . The tongue carries a conserved PRxSF motif, from which an arginine finger points into the chromophore pocket close to ring D forming a salt bridge with a conserved aspartate residue . Phytochrome belongs to a family of plant photoreceptors that mediate physiological and developmental responses to changes in red and far-red light conditions [PUBMED:1812812]. The protein undergoes reversible photochemical conversion between a biologically-inactive red light-absorbing form and the active far-red light-absorbing form. Phytochrome is a dimer of identical 124 kDa subunits, each of which contains a linear tetrapyrrole chromophore, covalently-attached via a Cys residue. This domain represents a region specific to phytochrome proteins. A clan of related transcriptional regulator domains. For those sequences which have a structure in the Protein DataBank, we use the mapping between UniProt, PDB and Pfam coordinate systems from the PDBe group, to allow us to map Pfam domains onto UniProt sequences and three-dimensional protein structures. The table below shows the structures on which the PHY domain has been found. There are 75 instances of this domain found in the PDB. Note that there may be multiple copies of the domain in a single PDB structure, since many structures contain multiple copies of the same protein sequence.